Transition a process from one domain to another (a domain transition). Transition an object from one type to another (an object transition). These transitions can also be achieved using the libselinux API functions for SELinux-aware applications. The source domain has permission to transition into the target domain. The application binary file needs to be executable in the source domain. The application binary file needs an entry point into the target domain. 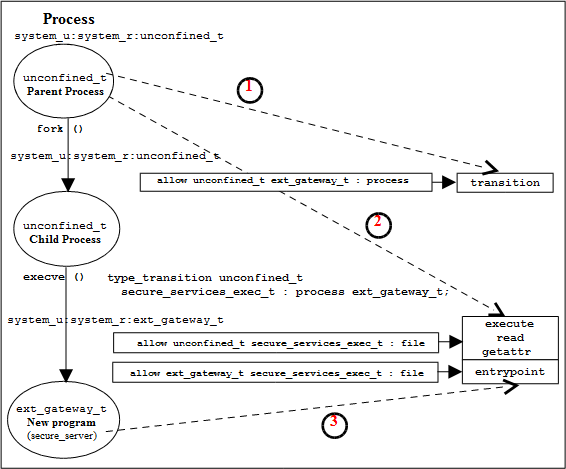 This type_transition statement states that when a process running in the unconfined_t domain (the source domain) executes a file labeled secure_services_exec_t, the process should be changed to ext_gateway_t (the target domain) if allowed by the policy (i.e. transition from the unconfined_t domain to the ext_gateway_t domain). These are shown in the domain transition diagram where unconfined_t forks a child process, that then exec's the new program into a new domain called ext_gateway_t. Note that because the type_transition statement is being used, the transition is automatically carried out by the SELinux enabled kernel. Ok: return value of 0. While the allow rules are valid to enable the transitions to proceed, the two type_transition statements had different 'default' types (or target domains), that breaks the type enforcement rule. # Note - The role is required as a role transition is defined in the policy. The runcon command makes use of a number of libselinux API functions to check the current context and set up the new context (for example getfilecon(3) is used to get the executable files context and setexeccon(3) is used to set the new process context). If all contexts are correct, then the execvp(2) system call is executed that exec's the secure_server application with the argument of '1111' into the int_gateway_t domain with the message_filter_r role. The runcon source can be found in the coreutils package. Use the runcon command for both gateways to transition to their respective domains. The type_transition statements are therefore not required. Use different names for the secure server executable files and ensure they have a different type (i.e. instead of secure_service_exec_t label the external gateway ext_gateway_exec_t and the internal gateway int_gateway_exec_t. This would involve making a copy of the application binary (which has already been done as part of the module testing by calling the server 'server' and labeling it unconfined_t and then making a copy called secure_server and labeling it secure_services_exec_t). Implement the policy using the Reference Policy utilising the template interface principles discussed in the Reference Policy Template Macro section. It was decided to use runcon as it demonstrates the command usage better than reading the man pages. drwxr-xr-x root root unconfined_u:object_r:in_queue_t . drwxr-xr-x root root system_u:object_r:unconfined_t .. This type_transition statement states that when a process running in the ext_gateway_t domain (the source domain) wants to create a file object in the directory that is labeled in_queue_t, the file should be relabeled in_file_t if allowed by the policy (i.e. label the file in_file_t). ↑ For reference, the external gateway uses a server application called secure_server that is transitioned to the ext_gateway_t domain from the unconfined_t domain. The secure_server executable is labeled secure_services_exec_t. This page was last modified on 25 September 2015, at 13:41. This page has been accessed 29,393 times.